The slain Lamb of God “who bears our sins away” is reflected in the dominant idea of Heidelberg Catechism, Lord’s Day 28, Question and Answer 75: “Christ’s one sacrifice on the cross” and that”…all our sins are completely forgiven through the one sacrifice of Jesus Christ…” (Heidelberg Catechism, Lord’s Day 30, Question and Answer 80). Gracious God, you have spread a feast to bind us to you and to each other. We want to gather at the table of the King. You feed us to nourish our love for you and for each other. With sheer grace you sacrificed your Son for us. We want to gather at the table of the King in Jesus’ name. Amen. 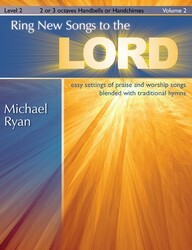 This song was written to be used during the communion portion of a service. The first verse prepares us to receive the elements, which are the focus of verse two and three. The final verse is a response of gratitude after we have received communion. There are a number of facets to this hymn. 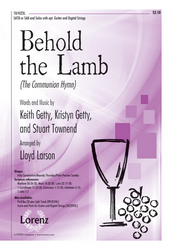 It is meant to teach and make clear what happens during communion, as well as make the experience come alive through lyrics that appeal to the senses. It also points us forward, placing the act of communion in the full story of the Gospel, anticipating Christ’s coming again. Keith Getty (b. December 16, 1974) and Kristyn Getty (b. May 22, 1980) are world-renowned modern hymn writers. 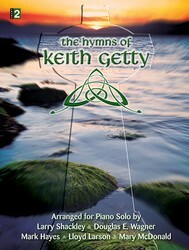 Keith developed a passion for writing good songs for the church in his twenties, and began writing for his small Baptist church. Kristyn studied English Literature at Queen’s University of Belfast, and the couple married in 2004. Both grew up in Ireland, but now live with their daughter Eliza Joy in Nashville. They write and perform together, and regularly tour the United States and the United Kingdom. Stuart Townend (b. 1963) grew up in West Yorkshire, England, the youngest son of an Anglican vicar. He started learning piano at a young age, and began writing music at age 22. He has produced albums for Keith Routledge and Vinesong, among many others, and has also released eight solo albums to date. Some of his better-known songs include “How Deep the Father’s Love,” “The King of Love,” and “The Power of the Cross.” He continues to work closely with friends Keith and Kristyn Getty, and is currently a worship leader in Church of Christ the King in Brighton, where he lives with wife Caroline, and children Joseph, Emma and Eden.